The exact nature and scope of human consciousness is something great thinkers, philosophers and scientists have puzzled over for centuries. It certainly seems like the more we think we understand consciousness, the more there is to learn, and experience. It was once called the great mystery, but more contemporary thinkers have labeled it the grand illusion, following Albert Einstein's lead in considering all of reality as merely an elaborate illusion, albeit a very persistent one. 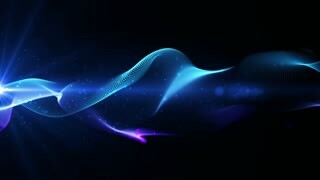 More recently some folks have built upon that paradigm by suggesting that reality and consciousness is holographic in nature, while others insist that we all exist within some kind of a computer simulation. When the obvious first question is asked regards to the operators of such holographic or computer programs; the popular answer is usually either our future selves, or maybe aliens. The next question is usually something about what purpose or use such an artificial simulation might serve. The answers here tend to be numerous and creative without being terribly convincing. It's a test. It's a game, It's enslavement. etc. I need better answers than that, I need an explanation way more sublime than that. First and foremost, I need answers which are congruent with my personal experiences with consciousness, yet not limited to just that. 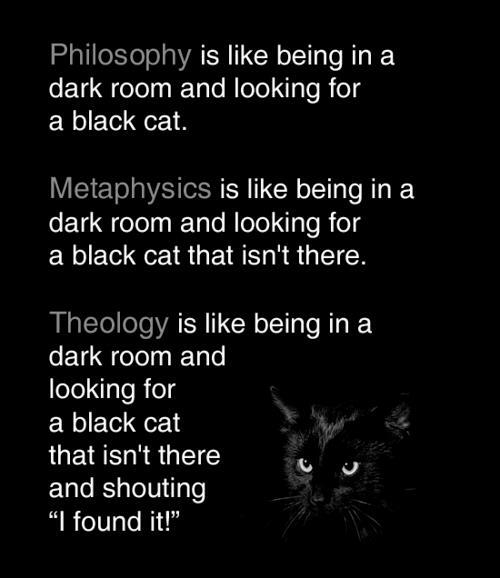 After that, I'm looking for an elegance missing from most explanations of consciousness and reality. 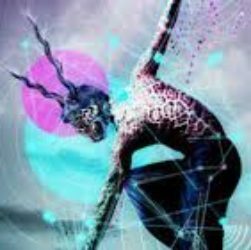 I have a problem with the computer simulation and holographic theories. What entities anywhere would have the time to write programs and sub-programs to create everything we see, hear, feel and do? Who is writing all this code, and for what purpose, for what audience or end user group? Seems lazy to me. 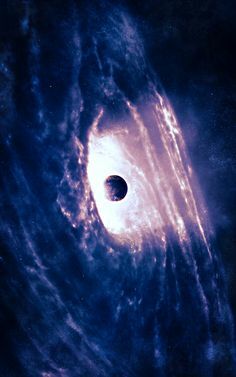 If we just say consciousness and reality are holograms or computer simulations, does that absolve us from a spiritual purpose?Nifty way to pawn off all our bad moves and mistakes...it was programmed! Sounds similar to another popular movement, but without the religious figurehead at the center.If everything and all of us are just bits of code, it's easier to say nothing matters. Computer simulations who invent computer simulations to entertain themselves with? The quest to understand consciousness is a lot like working a jigsaw puzzle without benefit of knowing what the finished puzzle will look like. Not only are we missing the top of the puzzle box to guide us; we also seem to be lacking an owners manual for this human instrument our consciousness resides in and directs. Religion; is answers that may never be questioned"
Dr. Albert Hoffmann's accidental discovery of LSD or lysergic acid diethylamide in 1938 ushered us into the age of psychoactive compounds which when taken allow us to experience unknown realms of our consciousness, and reality. Thirty years later; the compound he discovered was influencing a generation of Americans. Lamentably the greater potential of LSD is wasted on those who only take it recreationally to "enhance" their perceived reality. With the proper Intent, setting and conditions, Albert's little wonder drug can show you some interesting and profound things about consciousness and reality. Conversely, if done when in a foul mood, or emotional turmoil, it can immerse one into many hours of extreme psychological discomfort, aka, the bad trip. Native American shamans of course have a very long history of using Peyote and other psychoactive mushrooms in both spiritual and ceremonial expressions. 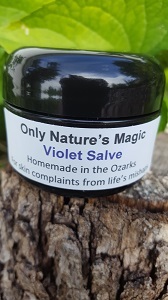 These natural chemicals have the ability to open the conscious mind to vaster realities, indeed even allowing one to travel in other realms, experiencing other entities, and spirit animals. Or you can just spend four hours laying in a field staring at the clouds & feeling all floaty. Once again, those who use such drugs to "escape" the reality they created to begin with are missing out on a universe of understanding. For the serious psychonaut there is a compound of all natural ingredients hailing from south america called Ayahuasca. It isn't something you "try" or take recreationally, or even without supervision & guidance. It's that potent; and it will show yourself to you, warts and all, and seldom in a gentile enjoyable way. It rocks your world, literally! Then there is Iboga, or Ibogaine as it's called nowadays which has found a home in the medical community as an aid to breaking addictions. Iboga is another psychoactive plant. It is an Indole Alkaloid; and in spiritual use it has two distinct phases. The first is the visionary state, followed by the Introspection state lasting from 4 to 6 hours. Iboga is considered an Oneirogen due to it's dreamlike effects. The sensation is very similar to lucid dreaming, that is to say, being fully conscious while in a dream state. Iboga shows yourself to you much like Ayahuasca does, but is way gentler and somewhat easier on the physical form. Again, as with Ayahuasca, best results with Iboga are obtained with the help of supervised guidance. shamanism is based on is life trivialized, life denied, life enslaved to the ego"
Being constantly intrigued by that untapped 90% of the human brain; I couldn't help but become an avid fan of the late Terrence McKenna and his explorations into the realms of human consciousness. It is perhaps interesting to note that while McKenna advocated mostly the spiritual use of mushrooms, he also occasionally spoke of their recreational value as well. McKenna was a true shaman, being extremely well versed and experienced with most if not all psychoactive substances. He long maintained that the only reasons governments ban such things is because they tend to free the mind, and then the soul, from the machinations of ego and "society." Ironically, nearly everyone who denounces psychoactive substances, has never used them. Consciousness isn't something that can be easily categorized, or crammed into a single confined conceptual "space" or definition. Another shaman named Stuart Wilde once said that "if you can't explain it in 25 words or less it isn't the Godforce" and yet most of us find defining consciousness akin to nailing smoke to the wall. We know that we have it, yet we don't really understand it all that well most of the time; because if we did, we'd be doing better things with our lives! After hearing about the substance DMT for many years, I got my first chance to experience it about four years ago. 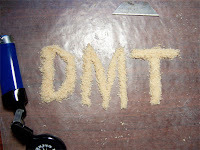 DMT, or, N,N Dimethyltryptamine is created by the human body, in the pineal gland, and is a chemical released at death. It is a structural and functional analog for serotonin and melatonin. Also naturally occurring in over 50 plant species from ten families, DMT is one of the active ingredients in Ayahuasca as well. 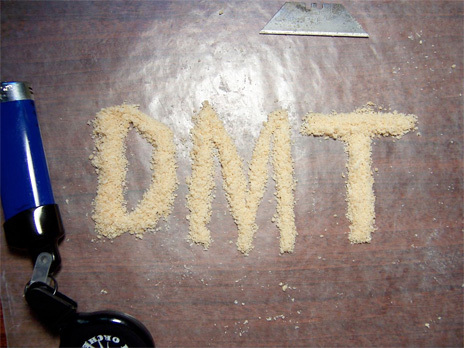 All of the experts agree, DMT is the most powerful psychoactive agent known to science. That's a ringing endorsement for any well traveled psychonaut. However, for being the worlds leading psychoactive substance; the effects of DMT are exceedingly, maddingly brief. The average DMT trip lasts only five minutes or so! It's just hard as hell to talk about." While the clinical studies conducted by Dr. Rick Strassman used injections, the more contemporary users today are smoking or vaporizing it. In his book, DMT: The Spirit Molecule, Dr. Strassman's volunteers were injected with a serum; I believe the clinical subjects with perhaps purer extracts may have had experiences lasting somewhat longer than five minutes. As with any psychoactive substance, one's mood, attitude and frame of mind will influence the kind of experience one has; and this is very true with DMT. Before my first DMT experience I had the benefit of others who shared their experiences with me, trying to prepare me a little. 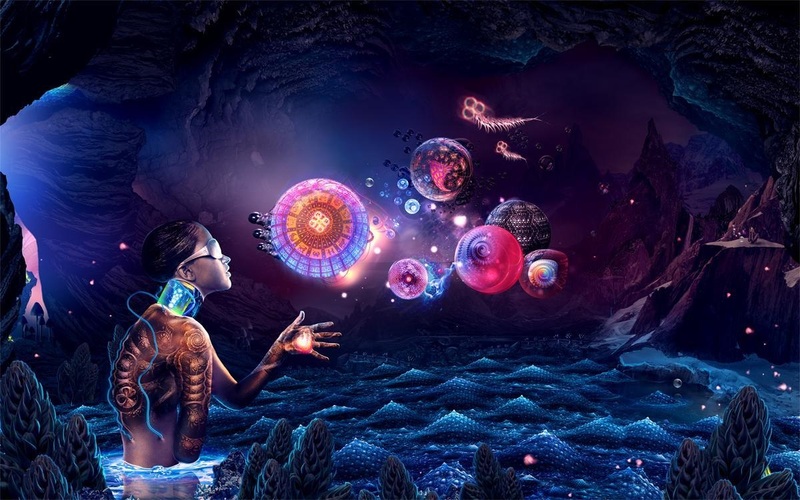 A little was about all the help it was, because more than any other substance or compound, DMT is a very personal experience. Are there hallucinations? Oh, you bet! Better and stronger by far than any I've had on LSD. 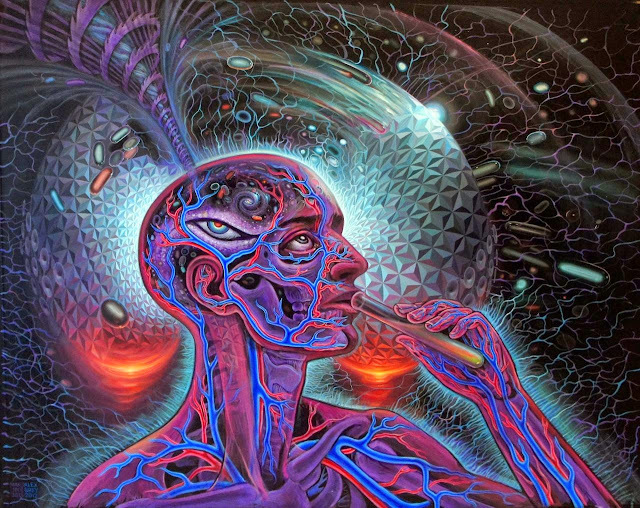 My first experience with DMT was smoking some with a friend who extracted it himself from various plants. It was late afternoon when I hit the pipe load of DMT. As suggested by my friend, I took 2 full hits from the pipe then put it down on the coffee table. For a moment it seemed nothing was happening, then after a few seconds there was this rush of wind and a slight wormhole vortex effect, then the room was back to normal. After a few moments I was about to tell my friend I wasn't impressed, when my front door opened and in walks a little gnome-like fellow who looked shiny and nearly translucent. Without so much as a nod, this trans-dimensional fellow strolls right by my chair, goes into my kitchen, opens the refrigerator and climbs in, shutting the door behind him. No previous experience with hallucinogens had ever been so sharp, clear and life-like. This was some serious kind of Blu-Ray hallucination ... or was it something more. As I marveled over the resolution of the hallucination another entity drifted in thru my front wall, floated right up to me, looked me in the eye - and winked at me just before disappearing faster that whiskey at last call. I looked over to my friend and while it was evident he was watching something, it was clear he was seeing something entirely different than myself. Waiting to see if anything else would happen, I noticed the room had a strange look and feel to it. Something I couldn't quite put my finger on right then in the moment. When the effects subsided a few minutes later I told my friend about the little entities I encountered. He told me that seeing them is indicative of the first stage of DMT, he called them gatekeepers, Terrence McKenna called them Machine Elves. My friend then explained to me that there are three stages, or levels to a DMT trip, and meeting the gate keepers is just the first. Then he told me that very few people will experience all three levels the first time or two. There is a real tendency to become stuck in phase one because of the "oh wow" factor, without realizing there is more in store. Be very accurate when measuring doses, to avoid a stronger dose than you want! The first level of DMT is the realm of the gatekeepers as previously described. There is nothing wrong with hanging out here a few times until you get a sense of the room so to speak. The second level is known as Blast Off, and you'll know you're entering it by the marked sensation of rushing through a portal, vortex type wormhole, similar to the initial whoosh, but much stronger. The second level consists of deep introspection of self, along with a powerful sensation of disassociation. You feel out of body with a sensation of being wide awake and conscious within a dream. This level provides a very non-confrontational environment for self assessment. The third level is called No Mans Land because here we find a very broad range of environment and experience. Meetings with aliens and other entities is exceedingly common; as is the teleportation to fantastic realms beyond the one we know so well. It is in level three where real interactions with other life forms occurs, not to be confused with the gatekeepers and machine elves in level one. The most deeply profound spiritual experiences happen here. Many have said they spoke with the Godforce. The surreal experiences and sensations encountered here have led some to feel like they were dying. 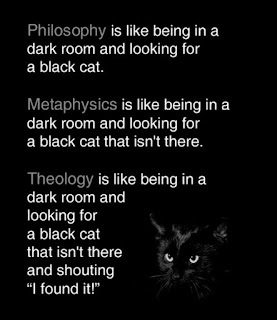 that makes you happy or unhappy, It's what you think about." My first experience with DMT was so realistic and profound that it took several days to process & integrate what I'd seen, and experienced. My friend had generously left me with several more doses, and told me that while some folks take DMT daily, such might not be advised for beginners like me. Suddenly I found myself of two minds on a couple of important questions. When did I want to do it again, and whether to read up on the subject before the next experience? With the first experience being so very positive and enjoyable, I was eager to go again within a few days, but should I wait? I also wanted it to be very much organic & authentic; would researching it further perhaps influence my next experiences with DMT? The second time I smoked DMT was about two weeks later, about 2:00 in the afternoon. My friend had suggested that doing DMT outside in the daylight was a peak experience, for him; so I thought I'd give it a try. There is a secluded little koi pond on a corner of my property; splendid setting for a DMT meditation I figured. This time I did a brief intention meditation first, after just sitting for a few minutes. After smoking the DMT, the whooshing vortex thing happened again just as before during which everything around me was somewhat blurry & out of focus. A few seconds later, everything was back in focus, but far from normal. I could see the photosynthesis happening in the leaves of trees, like tiny droplets of iridescent pearlessence driving home on the freeway. I could hear the sound sunlight makes. I could see the color of the breeze, and when a curious squirrel peeked around a tree trunk at me, I could see inside him like X-ray vision. I looked down at my feet which became tree roots growing into the ground, and I felt not only like I was connected with Gaia, but a part of her for the first time. Whatever I looked at, I could see the entirety of it, all in the most perfectly complete detail. Subtle movement in the grass caught my eye, and when I gazed at it closer I could see small unknown little multi-legged creatures all calmly going about their business, oblivious to my presence. Turning my attention away from the tiny creatures I was startled to see a machine elf sitting next to me, hell, he might have been there all along. He wasn't looking at me, so, not wanting to spoil the moment I just sat there silently next to him gazing at the leaves. I became so focused on the trees and flying insects I never saw or heard my visitor depart, but as I got up to return to the house a voice on the breeze said I could return whenever I wanted, presumably as long as I had some DMT extract. After collecting a couple more DMT experiences as a framework for reference; I began studying & researching the chemical. Dr. Strassman seems to be one of the preeminent scholars researching this field, along with Terrence McKenna, and Graham Hancock. When I felt my background information was adequate, a few weeks after my second experience; it felt right to have another go at it. Whereas most of the experiences I actually had are rather common to everyone, I was ready for the deeper, fuller experiences I'd been reading about. I figured for my third time, upping the dose was in order. Declaration of Independence isn't worth the hemp its written on." Now the books, experts and my own experience agree that DMT is nothing like psilocybin or even LSD. It isn't a kaleidoscopic roller coaster ride full of rapid fire hallucinations like acid, and it isn't even very similar to mushroom trips. I wanted an "A" ticket ride, so for this experience I nearly doubled the previous doses. This time it was well after dark, and I was in a mood to experiment. I have several videos of moving fractal images set to relaxing music, which are stunningly beautiful normally, so I decided to have one playing on the big screen TV before I smoked a bowl of DMT, just to see what would happen. After doing my best to assimilate the entire double dose, the whooshing vortex sensation came as expected, however at the same time I saw & heard water flooding out of my stereo speakers instead of relaxing music; and the moving fractals were no longer confined to the TV, or the screen, but began swirling about all over the room, and directly at me. The moving fractal images followed the walls & ceiling like laser beams, and at once I was inside of a 3D kaleidoscope of cascading shapes and colors. Within 30 seconds it was difficult to see much detail in the room as the spiraling fractals wrapped around me like a giant psychedelic python. The sensations were overwhelming after two minutes, but I was determined to ride it out. All things considered, leaving the safety of the chair seemed unwise. Four minutes in and instead of wearing down, the experience was actually getting more intense with every passing second; and was becoming a concern. Whatever music was on that disc, it came out like sounding like some kind of alien tinnitus on steroids; a sharp buzzing noise, which was getting louder. 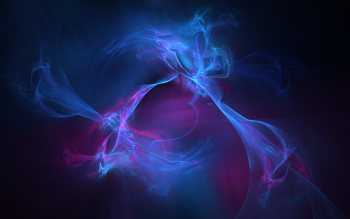 I could also hear the sharp, crisp sounds made by swirling fractals passing near my head; a sound not unlike sheets on the clothesline being flapped by a breeze. Time itself seemed very fluid and flexible as I soon realized I had no idea of how much time had passed so far. I thought to just turn off the TV, but I couldn't find the remote - because I couldn't see the desk it sat upon; everything was what was on the fractal DVD, and that's all I could see around me. At some point I saw my open bedroom door just five feet or so away, knowing my bed was just beyond somehow inspired me that I could make it before it disappeared again. From the doorway I literally threw my body on the bed with swirling fractals chasing me the whole way. I curled up in a fetal position, completely disoriented and unable to see anything but the fractals flowing from the big screen like lava from a volcano. I didn't feel especially threatened, beyond wondering if I was dying; because once on the bed it felt very much like I was sinking down into a whirlpool, so I just relaxed into it now that injury from falling down was less likely. 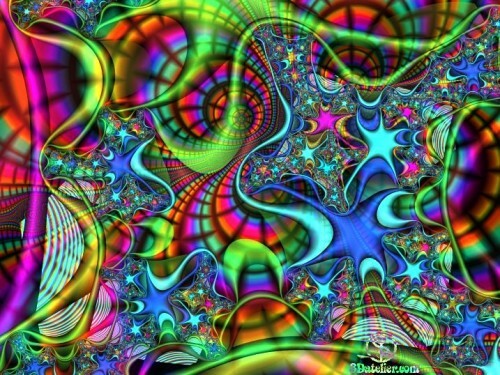 Closing my eyes made zero difference because even with eyes shut and covered by my hands, I still continued to see the gyrating, swirling fractals in every imaginable color. This continued for what felt like an hour before things started winding down. When the fractals melted away the feeling of vertigo subsided and I could again see the familiar surroundings of home sweet home. The wall clock said the whole experience had lasted a total of seventeen minutes! I want to meet the computer geek who can write code for that! That third experience with DMT was profound enough that I knew I didn't want to try it again for a while. I'd be needing the time to process my experiences. To be sure; I entered the experience lightheartedly with no intent other than exploration and experimentation. That as it turns out is insufficient as well as being ill-advised. As previously mentioned, this is the most powerful psychedelic on the planet. Six months after, I again felt like it was time to try DMT, having arrived at the conclusion that twice a year would be a good frequency of use for me. I would attempt to describe the next couple of trips if I didn't feel my grasp of language inadequate to the task. Perhaps the accumulation of experience transcends language altogether, nobody knows! I have come to understand why Rick Strassman calls DMT the spirit molecule I think, and that is because it might just be the key to unlocking the rest of our brains, and perhaps even lead us to that owners manual for being human. We could really use that right about now. you're automatically precluded from believing its opposite." From my empirical research with this substance I have come to believe that the term trip is more descriptive of DMT than it is LSD; because I think it takes consciousness to another place. I think that's what the whooshing vortex thing is all about, actually traveling somewhere else, even if its only the undiscovered country of that unused 90% of our brains. When it comes to comparing DMT to taking LSD; let me put it this way, over the last four decades I've done my share of acid, (and some of yours); and none of them can compare to the DMT experience. LSD is a ride, DMT is a journey! DMT is the event horizon of consciousness.